The vision explains the overarching societal developments towards which the University is oriented and clarifies the remit it must fulfil. Knowledge is one of the most important resources in our society, and it will only become more important in the future. Knowledge is the key to solving societal problems and overcoming global challenges. Universities make an indispensable contribution to the evolution and imparting of knowledge, and this task will become increasingly important. In everything that it does, the University feels its obligation to bring about benefits for science, society and the economy. The University of Bern wants to procure the competences required to acquire knowledge and to use that knowledge. With this aim in mind, the University of Bern conducts excellent research and teaching and offers high-quality advanced training and services. The University of Bern bases its disciplinary, interdisciplinary and transdisciplinary focuses on academic interests and societal needs. The University aspires to be the most important regional institution which generates independent knowledge and which promotes sustained value creation for the economy of the Canton of Bern. 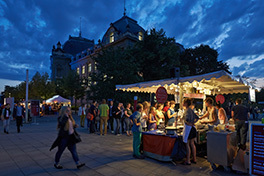 The University makes a major contribution to increasing the appeal of Bern as a centre of economic innovation and attractive working conditions. In this way, the University of Bern is able to honour its obligations to the citizens of the Canton of Bern who, after all, are the people who enable the University to exist.